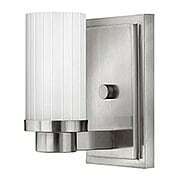 The Mercantile 2-Light Bath Sconce brings industrial chic to your modern bath. 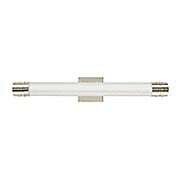 Frosted, pressed-glass diffusers, encased in wire guards, are horizontally connected by over sized hex-nut attachments. 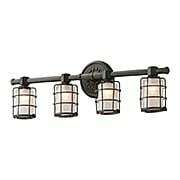 Designed for use over a mirror or vanity, this sturdy fixture is constructed from hand worked wrought iron and finished in vintage bronze. The Mercantile collection brings industrial chic to your modern bath. Frosted, pressed-glass diffusers, encased in wire guards, are horizontally connected by over sized hex-nut attachments. Designed for framing a mirror or vanity, this sturdy fixture is constructed from hand worked wrought iron and finished in vintage bronze. 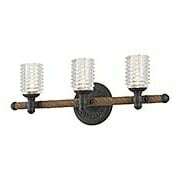 The Mercantile 3-Light Bath Sconce brings industrial chic to your modern bath. Frosted, pressed-glass diffusers, encased in wire guards, are horizontally connected by over sized hex-nut attachments. Designed for use over a mirror or vanity, this sturdy fixture is constructed from hand worked wrought iron and finished in vintage bronze. 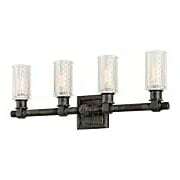 The Mercantile 4-Light Bath Sconce brings industrial chic to your modern bath. Frosted, pressed-glass diffusers, encased in wire guards, are horizontally connected by over sized hex-nut attachments. Designed for use over a mirror or vanity, this sturdy fixture is constructed from hand worked wrought iron and finished in vintage bronze. 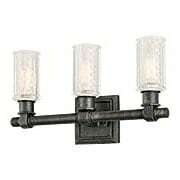 Crafted from hand-worked, wrought iron and wired glass, the Hoboken 2-Light Wall Sconce recalls early 19th-century industrial style. 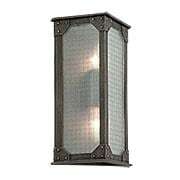 Wet rated for exterior or interior use, this versatile wall sconce is at home in a variety of spaces from kitchen, to bath, to any outdoor area - even ones exposed to rain! 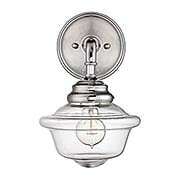 Features an aged-pewter finish for an authentic look. 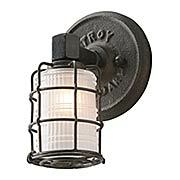 With a rich nautical presence and industrial-style details, the Embarcadero 3-Light Wall Sconce provides a welcoming glow to any decor. 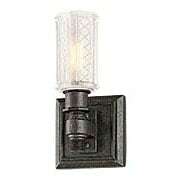 This rustic wall sconce is made from hand worked, wrought iron, and features a rich ship-yard bronze finish. Perched upon a horizontal rail wrapped in antique-manila rope, it lights the way with thick, pressed glass shades - inspired by the vintage insulators of the mid-1800's. 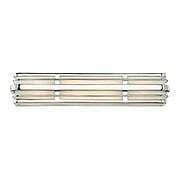 With a rich nautical presence and industrial-style details, the Embarcadero 4-Light Wall Sconce provides a welcoming glow to any decor. 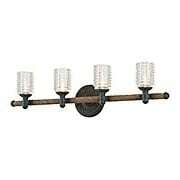 This rustic wall sconce is made from hand worked, wrought iron, and features a rich ship-yard bronze finish. Perched upon a horizontal rail wrapped in antique-manila rope, it lights the way with thick, pressed glass shades - inspired by the vintage insulators of the mid-1800's. 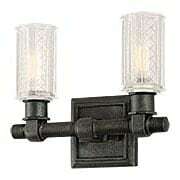 The Vault Wrought Iron 3-Light Vanity Sconce brings industrial style to modern baths. 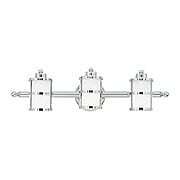 The frosted, pressed-glass shades, featuring a diamond motif, are horizontally connected by heavy-duty, threaded brackets. Designed for use over a mirror or vanity, this sturdy sconce is constructed from hand worked wrought iron and finished in aged pewter. ADA compliant. Fashionable and streamlined, the Dash 22-Inch LED Light offers low-profile lighting for your bath. 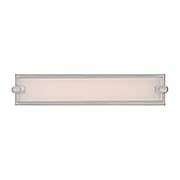 This horizontal fixture features an opaque glass panel and brushed-nickel finished frame. 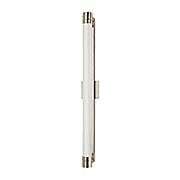 When used on either side of a vanity mirror, it provides an even, flattering glow, making it an ideal task light. Fashionable and streamlined, the Dash 30-Inch LED Light offers low-profile lighting for your bath. This horizontal fixture features an opaque glass panel and brushed-nickel finished frame. 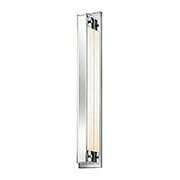 When used on either side of a vanity mirror, it provides an even, flattering glow, making it an ideal task light. 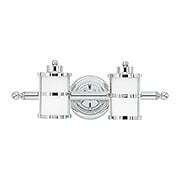 Inspired by the grand age of ocean travel, the Tranquil Bay Triple Sconce gives your bath a dashing nautical flair. 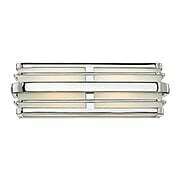 Art Deco in style, this dynamic design features banded glass shades, spherical accents and a brilliant chrome finish. Inspired by the grand age of ocean travel, the Tranquil Bay collection gives your bath a dashing nautical flair. 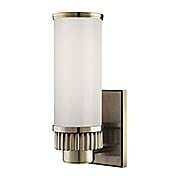 Art Deco in style, this sconce features banded glass shades, spherical accents and a brilliant chrome finish. Mirrored on its face, the Accanto 40-Inch 1-Light Wall Sconce emits a subtle glow from each side through crystal edges, while its polished-chrome finish adds extra sparkle. Suitable for framing a vanity mirror or mounting in a series down a hallway, this eye-catching accent brings modern flair in a sleek silhouette. 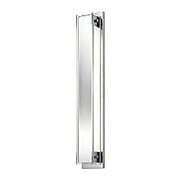 Mirrored on its face, the Accanto 26-Inch 2-Light Wall Sconce emits a subtle glow from each side through crystal edges, while its polished-chrome finish adds extra sparkle. Suitable for framing a vanity mirror or mounting in a series down a hallway, this eye-catching accent brings modern flair in a sleek silhouette. 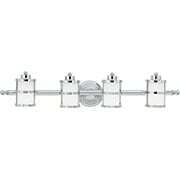 Mirrored on its face, the Accanto 40-Inch 2-Light Wall Sconce emits a subtle glow from each side through crystal edges, while its polished-chrome finish adds extra sparkle. 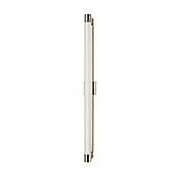 Suitable for framing a vanity mirror or mounting in a series down a hallway, this eye-catching accent brings modern flair in a sleek silhouette. 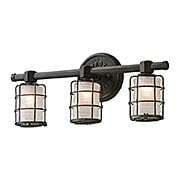 Early 20th Century style school house fixtures are a timeless addition to your home. Offered in multiple sizes, you'll find options for every room, from kitchen to foyer to bath. 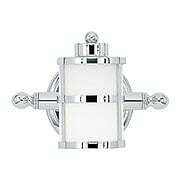 This wall sconce comes with a clear glass shade and a gleaming chrome finish, lending a contemporary twist on its vintage design.